The Noble and Greenough Strength & Conditioning Program supports the mission of the school and the athletic department. It is the mission of our program to provide the best and most appropriate training experience for the Nobles student while developing the program’s core values of belief, personal accountability, toughness, and leadership. These values will be taught through a mentally and physically challenging process. Students will work together to develop their physical performance, confidence, self-esteem, and collaborative skills in a positive atmosphere. Belief that you were created to be great. The integrity to own your actions. The mental and physical toughness to deal with life’s challenges. Lead with passion. Lead by example. 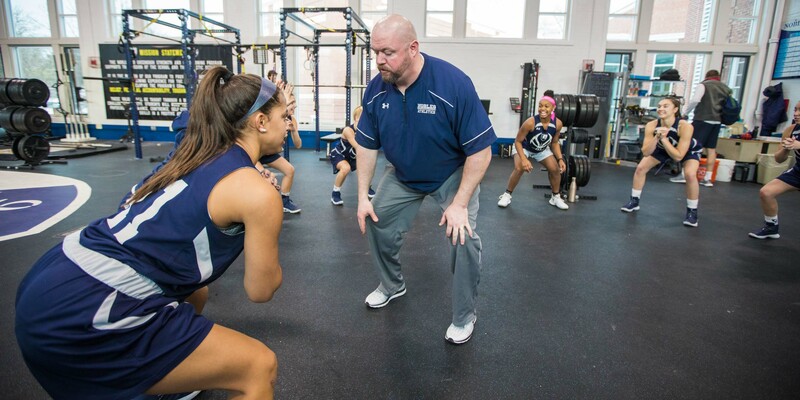 Coach Kevin O’Neill runs the strength and conditioning program and is in charge of team training and individual workout options for students and faculty. Kevin works in conjunction with the sports medicine staff to coordinate rehab programs for injured athletes in the Fine Family Strength & Conditioning Facility.